The Asgard and the Budget: As part of the cutbacks announced in the budget of 9th December 2009, Coiste an Asgard, the State body responsible for Sail Training in Ireland, was abolished and with it any hopes of a resumption of sail training in Ireland or a replacement for the Asgard II which sank off France last year. Further, the insurance money from the loss of the Asgard II has been transferred to the Exchequer to be used for other unspecified purposes. So, that ends the Asgard and any hopes of a resumption of sail training in Ireland. Most unbecoming of our Island nation. There are moves afoot to replace the Asgard (and the smaller Lord Rank) with a new Irish Sail Training vessel as reported in today's Irish Times. A new group has been formed, who believe that the construction of a new vessel is possible. A conference is planned for March 26th 2011. The Irish Times reported today that the report into the sinking of the Asgard in 2008 would be published by the Marine Casualty Investigation Board in the next two weeks. The Irish Times reported that a team of Irish divers had recovered the ships wheel, bell and compass from the Asgard, and that they were to be offered to the National Maritime Museum. A former master of the Asgard, Captain Gerry Burns organised the dive, which was led by Eoin McGarry (a Waterford man) along with a team of experienced divers. The divers reported that the ship was still upright but listing to starboard but she was without the wheelhouse and mast, which were probably removed by trawling activity in the area. The Sail Training organisation, Coiste an Asgard, has asked that the artefacts be returned, stating that no permission had been given to anyone to dive on the vessel. The team of divers were arranging for the conservation and restoration of the artefacts and were delighted to have these important items for the Irish people who always had a great love for the Asgard. According to today's Irish Times, a draft report on the sinking of the Asgard, concluded that it may have struck a container or even a whale before sinking in September 2008. The report also states that one life raft failed during the evacuation but the trainees onboard were promptly transferred to other rafts, in what was an orderly and professional evacuation of the sinking vessel. The final report will be published once comments on its conclusions have been seen considered by interested parties, including the crew. According to today's Sunday Tribune Newspaper, a final decision not to save the sunken Asgard II was made after the head of the Naval Service said he would not allow his children on it if it was refloated. At a meeting of Coiste an Asgard, Commodore Frank Lynch, the highest ranking naval officer in Ireland, said he would have "serious reservations" about salvaging the craft. According to minutes of that meeting: "Commodore Lynch... said that substantial expenditure on the refurbishment of a 27-year-old vessel was not justified and maintenance costs would begin to increase after 30 years. He also indicated that if one of his children was considering a voyage on the refurbished Asgard II, he would have serious reservations in the matter and would probably refuse permission. Two other board members at the meeting in February 2009 agreed with "this sentiment" and a final decision to leave the sunken vessel alone was agreed. According to the Irish Times, the Minister for Defence Willie O'Dea has expressed optimism that the Government will be in a position to replace the national sail training vessel, Asgard II, which sank a year ago today while crossing the Bay of Biscay. He has, apparently, written to Minister for Finance Brian Lenihan informing him of proposals to use the €3.8 million insurance money resulting from the loss of the Asgard II to buy a replacement steel-hulled vessel, at an estimated cost of between €3.5 to €4 million. 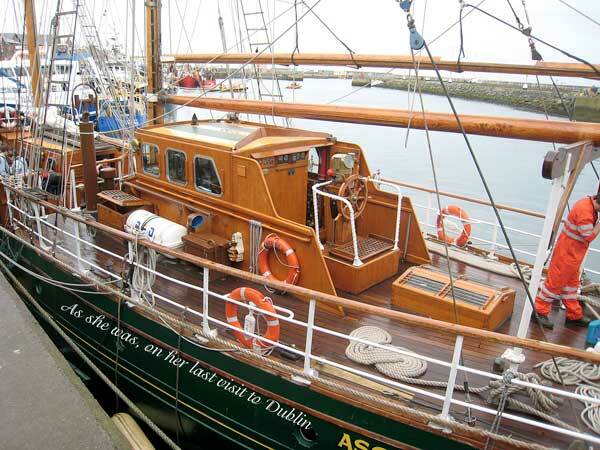 According to a report in today's Irish Times, the Government has indicated that it may not replace the Asgard II, even though it has received an insurance payment of almost four million euro because of the loss of the sail training vessel. 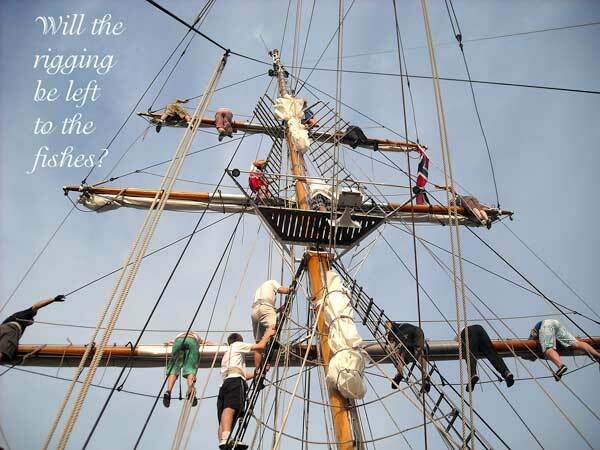 There is even a possibility that the sail training programme may be abandoned altogether, thus saving almost a million euro annually, as recommended by the recently published Bord Snip Nua report (the McCarthy report on Public Service Numbers and Expenditure Programmes). Currently there is a very limited training programme using the Creidne, the Naval Service yacht. Australia's bicentennial has been very exciting so far and for me it has been absolutely fantastic - thank God. It all started sometime in July last year when the Australian-Irish Society asked me to help if they got the ASGARD II out for the Tall Ships visit. After much deliberations and many etceteras, she finally arrived on board one of the world's largest container and ro/ro vessels - BARBER HECTOR on 13th December. She was the first of the Tall Ships to arrive in Sydney. Her permanent crew of 6 lost no time in "turning to" in getting the masts stepped etc and in 3 days she was ready. That the skipper was Tom McCarthy from Cork and so was most of the other crew really must have helped but modesty prevents me from saying so. On the 18th the first group of trainees arrived and she soon became a very popular sight on our Harbour. ASGARD was a very happy ship from the moment she arrived and the 17 Irish and 4 Australian trainees were wonderful young people but she commenced her Aussie coast voyages when she sailed from Sydney at noon on Dec 23rd for Melbourne, where she joined the other Tall Ships for a New Year party....................Hobart gave the Tall Ships a tumultuous welcome, and it was good to see the ASGARD and her crew again. As organised I signed on ASGARD as 4th Mate for the Tall Ship's Race - Hobart to Sydney. Our trainees were changed on the 12th and a lovely bunch of lily white Irish boys and girls again joined. I met them at Hobart airport and managed to get them out of the sun before barbequing commenced. At last we got a Waterfordian, Billy Coad from Dunmore. He was a very nice lad and a good worker. I don't think he believed me that I was ever in Dunmore. Again a wonderful trip - she is a great sea boat. Maybe I shed a tear when we left the pier at Hobart as it was just over 42 years since I sailed under the Tricolour and that was on the IRISH FIR with the boys from Passage East. I felt they were with me as we sailed up the east coast of Tasmania..........On Australia Day, Betty and I joined ASGARD at 6am as the shore approaches were closed after that. The salute was taken by Charles and Di on HMS COOK. Asgard passed very close to Di and was given a special cheer for wearing a green costume. I felt very proud to be an Aussie that day but twice as proud of being Irish........After Irish Week, ASGARD went roving to Brisbane but was back in Sydney by early April. This time she was unrigged, unmasted and again slung snugly on board the BARBER TOBA which sailed for Antwerp via the Pacific. Jack Rahilly was originally from Crosshaven in Cork before emigrating to Australia. Jack died in 1998. Some sort of a system may be established to allow for voluntary contributions to salvage the national sail-training vessel, Asgard II, which lies in 80m of water off the French coast. Minister for Defence Willie O'Dea told the Dail, the Irish Parliament, that if the contributions were sufficiently high, the Government might even make a contribution. 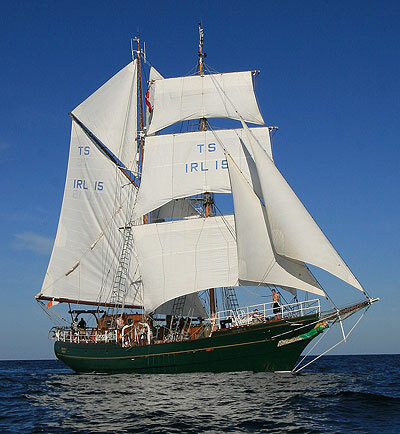 Someone else has suggested that the Jeanie Johnston should become the Irish sail training vessel. She is laying idle in Dublin's docklands, and there are no plans to sail her in the immediate future. The Jeanie Johnston is owned by a State body, Dublin Docklands Development Authority, and it would seem to make sense for the Authority to loan the ship so it can conduct sail training on an Irish vessel. The Jeanie Johnston has been used for this purpose in the past and would, apparently, be a most suitable replacement for Asgard II. End February It's not over yet?? 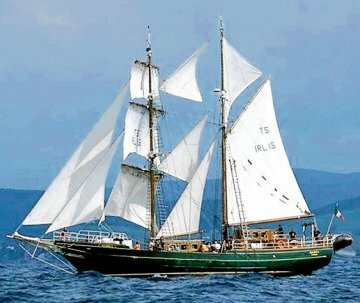 Capt Colm Newport, master of the sail training ship Asgard II and now working as a pilot in Dublin Port, has been contacted by a group of Belgian shipowners who said they had a potential €4 million budget and were interested in salvaging the Asgard II and restoring it for sail training. Mr O'Dea, Minister for Defence has said that he is open, to considering any proposals from private individuals or groups as to the future of the Asgard II vessel. The estimated price for the lift would have been around €2 million and several French shipyards have been identified as being capable of carrying out emergency treatment work on the ship before full restoration. Allianz, the ship's insurers, have confirmed that the ship will remain in the ownership of the State even after it pays the €3.8 million cheque for total loss. It has been decided not to attempt a salvage of the Asgard II following its sinking off the northwest coast of France last year, Minister of Defence Willie O'Dea announced today. Mr O'Dea said the board of Coiste An Asgard had a "full discussion" on salvaging the national sail training vessel but came to a unanimous view that a salvage operation should not be pursued, and that he had accepted its recommendation. He said that spending in the region of €2 million on a salvage effort, the outcome of which is uncertain, is something that cannot be afforded at this time. A limited cruise programme will be provided on the Creidne , which was used for sail training prior to Asgard II and a number of places for Irish trainees will be reserved on the Norwegian sail training vessel, the Christian Radich, during the Tall Ships races. The Minister for Defence Willie O'Dea has been advised to leave the existing wooden-built brigantine on the seabed off northwest France, and to build a steel replacement on safety and cost grounds. The recommendations have been made by Coiste an Asgard, the committee which manages the sail training programme on behalf of the Department of Defence. Coiste an Asgard now believes that the insurance money would best be spent on building a steel replacement, given that the cost of salvage could be €2 million and weather dependent. It is understood that the committee also believes that the cost of restoration after salvage could be prohibitive, and prospective trainees might not wish to sail on a ship that had already sunk. Some sail training organisations prefer to rely on steel vessels for safety reasons, and because of the cost of maintaining wooden ships. He added that there were "a number of difficulties with the salvage operation". The Minister for Defense, Willie O'Dea T.D., in response to questions from Brian O'Shea (local TD from Tramore in Co Waterford) in the Dail (the Irish Parliament), said that the estimated cost of raising the Asgard would be around €2 million and that a decision is imminent on whether the boat will be raised. The Minister said he had to bear in mind the costs of reinstating the brigantine, how long it would take to make her seaworthy again and the provision of alternative arrangements for sail training in 2009. Ireland's Sailing and Motorboating magazine, Afloat, has launched a petition, which began last week, to lobby to have the Asgard raised from the seabed. Well-known balladeer, Jimmy Crowley has said that he is prepared to play benefit gigs in the US, where he now lives, to help to raise the necessary funds for the salvage effort. Jimmy is one of Ireland's best singers and he regularly includes sea songs in his repertoire. He also wrote that enchanting song My love is a Tall Ship. Tom McSweeney's programme on RTE Radio 1, broadcast on Fridays at 10.30, is expected to air the petition on this weeks programme, 6th February.